This photo is a "drone's eye view," though there was a hawk soaring about a 1/4 mile away and about 300 feet higher than my drone. 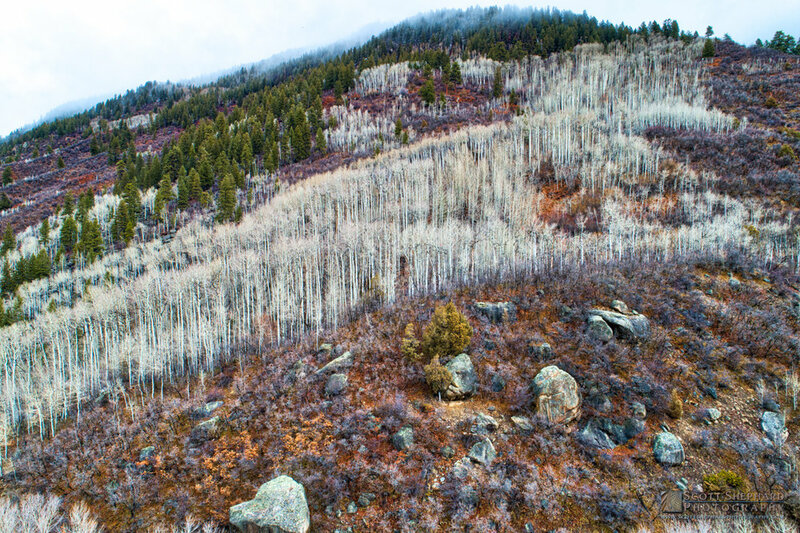 When I am shooting landscapes like this with my drone, I am always cognizant of wildlife, in part because this is their territory, not mine, and also in part because birds can be territorial and have been known to attack drones. I've never been buzzed by birds of prey but I have had 4 or 5 killdeer attack my drone. In this case I was allowed to get my "aspen fix." I took quite a few photos of these trees but I like this one because I think it offers you a way to see the world you may not have had before. That's what photography often attempts to do. And, for those who want something a little less abstract, here are a couple more photos that I took near Aspen, Colorado, yesterday.